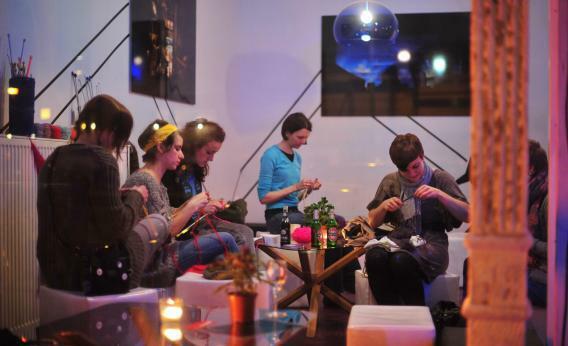 A year ago, my colleague Farhad Manjoo wrote about “the best social network you’ve (probably) never heard of,” an online community for knitters called Ravelry. The knitters, though, aren’t purling away in total anonymity. At least one powerful group is watching their every cross-stitch. That group: the U.S. Olympic Committee. But the Olympians picked the wrong people to needle. NPR’s news blog The Two-Way reports that outraged Ravelry members pelted the committee with emails, tweets, and comments on the U.S. Olympic Team’s Facebook page, decrying the letter’s insulting tone. They even tracked down the Twitter account of the hapless clerk who sent the cease-and-desist note. The backlash prompted Gawker’s Chen to liken the group to “Anonymous with pointy sticks. That may be embroidering things a bit, but there’s no question the committee soon grasped the folly of putting itself on Ravelry’s wrong side. To mend relations, it apologized—twice—and NPR says its plans to take legal action have unraveled. Let’s hope the Olympics’ stuffed shirts, from USOC to IOC to Locog, learn a lesson from this affair. From a doll-making grandma in Downham Market to a butcher in Dorset, the London Games’ overzealous intellectual property crackdowns—especially inappropriate for what’s being billed as “the first social media Olympics”—have become an ugly pattern. If such behavior persists, we’ll keep you in the loop.